Fleeing the snowy north, we headed south to a great town, nestled in the mountains. Looking for accommodations we headed to Walmart waaaaay out in the west area on Nob Hill Blvd. Talked to the manager, and he said to park on the west side for overnight. Big store, just over 4 years old, great produce section! It’s wasn’t open 24 hours (this was in late February), but a great place to stay over and shop – great fresh produce, lots of bargains. It was winter, but every person we met was full of summer warmth. Now we were new in town, but in need of a treat! 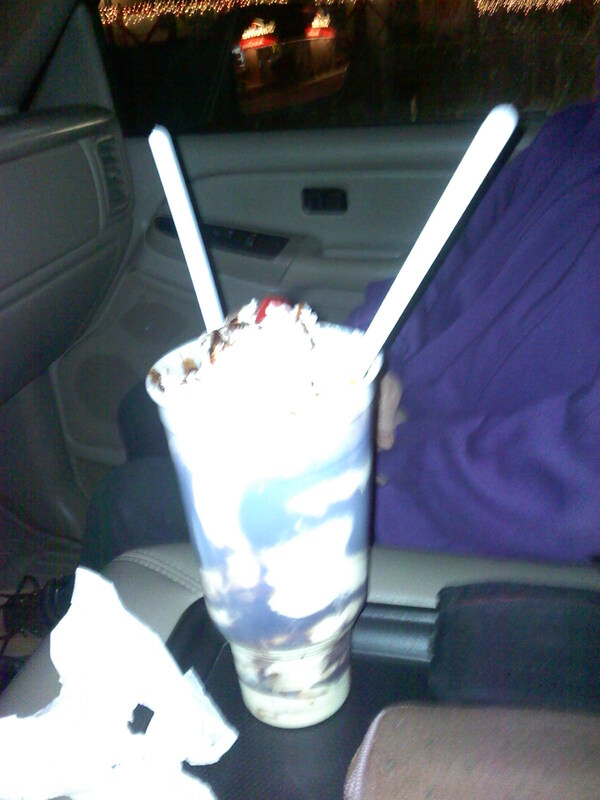 Look up Ron’s for a late night sundae! Got a brownie and hot chocolate number in a 32 oz cup – talk about poundage! Way too much for two people, but maybe the best soft-serve sundae in the West! Big, chewy, fresh brownie pieces. Great hot fudge – and plenty of it in layers. Glorious gobs of whipped cream. I froze what I couldn’t eat and enjoyed it the next day – it was amazing even then. Took this picture with the phone … but you get the idea. Cheap gas? Try Cenex (self service) at 1st street, by the Taco Bell. Catch a morning espresso at HeBrews coffee on 1st and “D”. Note the back of the building: “In memory of Bob Kolve and Kathy Painter” … gotta be an amazing story behind that. Be sure to take to heart “Hebrews 11:1”, which reads: “The fundamental fact of existence is that this trust in God, this faith, is the firm foundation under everything that makes life worth living. It’s our handle on what we can’t see.” (taken from The Message). Hey, it sure works for me.